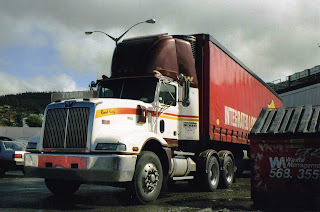 Many of my previous truck photos were taken in the 80s, but here are some, all taken within the last 5 years. 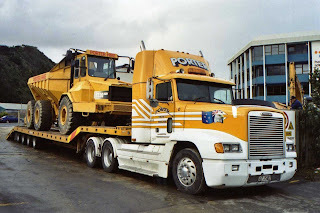 A four axle semi-trailer and 4 axle Kenworth. 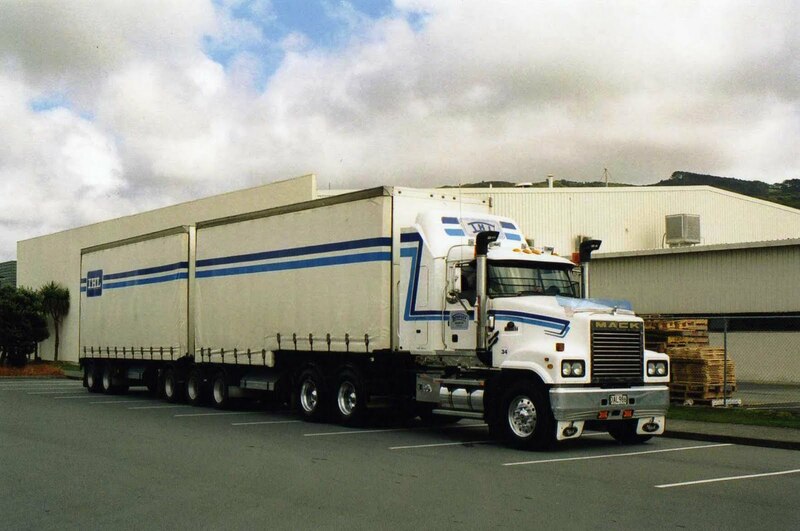 A typical kiwi big rig configuration. 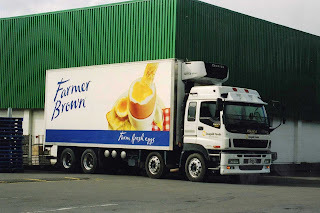 Alexander Bulk Liquids' livery is simple, but effective as seen on this 1998 Freightliner FLD parked Copthorne Solway Park Motor Inn in Masterton. Earlier this week I had to travel over 400kms return trip to pick up a new vehicle for the company I work for. During the drive I was surprised to pass three Mack Ultra-Liners still earning their daily keep. Above is a 1989 R688 working for Halverson Luke earthmoving contractors. Another evening at the Copthorne Solway Park in Masterton with four of Alexander Bulk Liquids' yellow "beasts" parked up for the night. 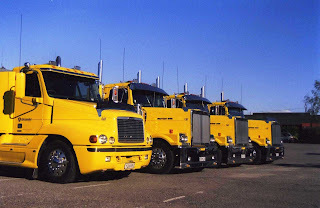 One Freightliner and three Western Stars. 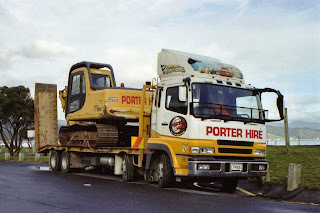 Porter Heavy Haulage (a division of Porter Hire) use this 1997 Freightliner FLD to transport their heavy hire equipment. 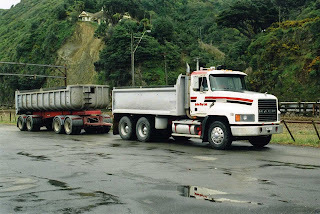 Their Petone hire depot is the setting for this unloading shot. 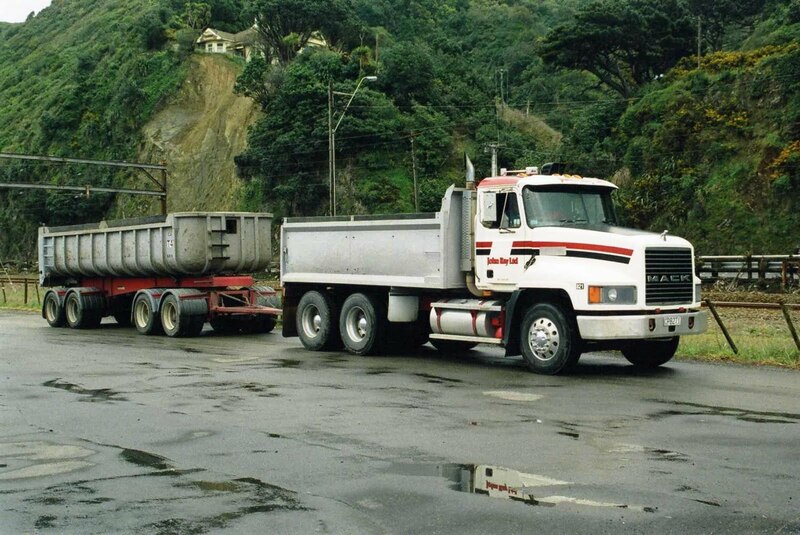 A Western Star conventional must be one of the most impressive of the big rigs on kiwi roads. 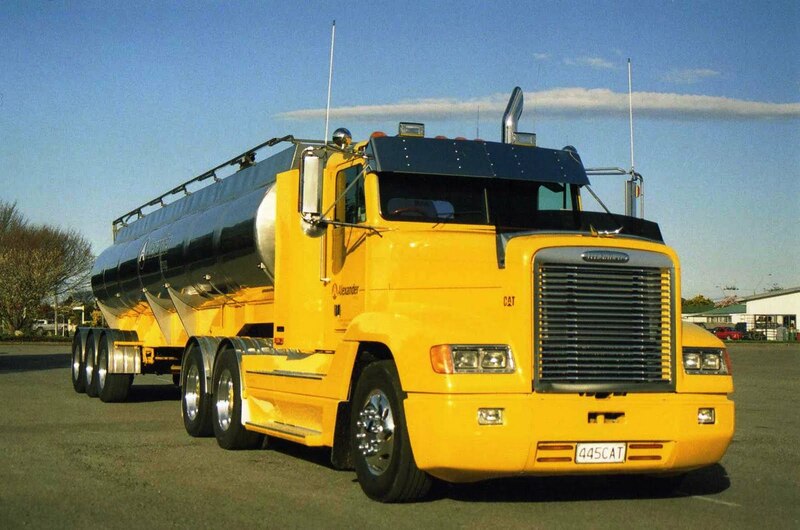 This 2006 4964FX is a fine example, with it's tall exhaust and inlet stacks and a good dose of polished metal. 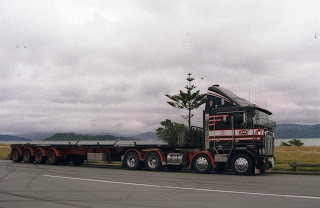 It is painted in Mainfreight colours and pulls a 3+3 curtain sided B-train. 460 horses push this Isuzu CYJ Giga along the highway. 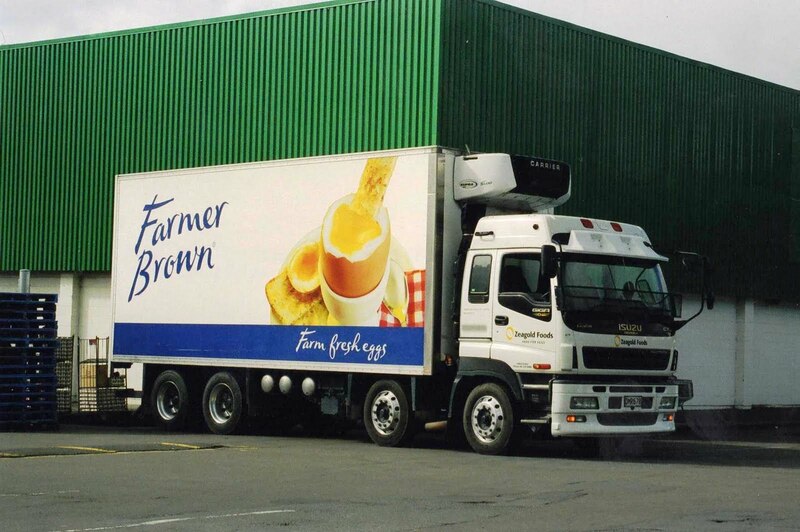 This 8 wheeled example belonging to Zeagold Foods is unloading at Countdown supermarket in Wainuiomata in the Wellington area. 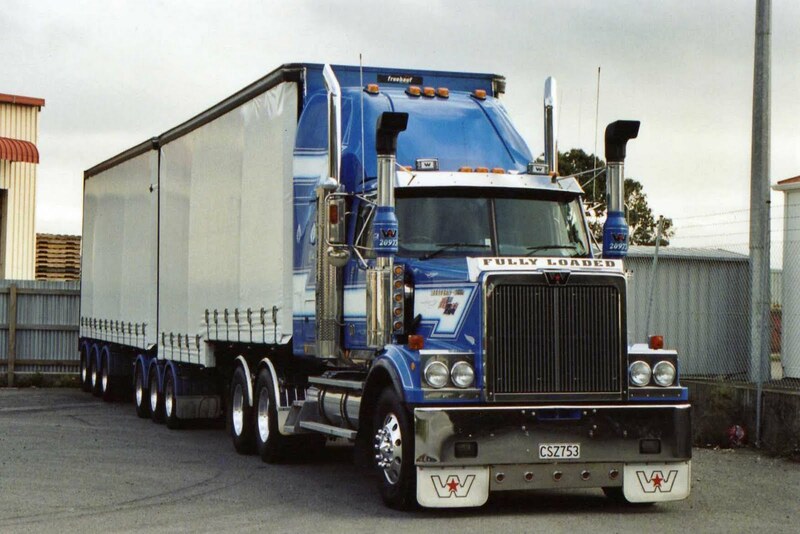 Many of these "small wheeled" 8 wheelers have been imported into NZ from Japan as used vehicles. Their small wheels make their chassis low enough to be a useful low-loader or a maximum capacity box body. This low-loader of Porter Hire is a 2003 Fuso (Mitsubishi) FS54 at Petone, just across the harbour from Wellington City. 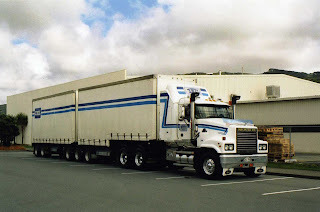 Woolworths supermarket at Tawa is the scene for this Tyson Holdings "droop nose" Western Star unloading it's Linfox trailer. 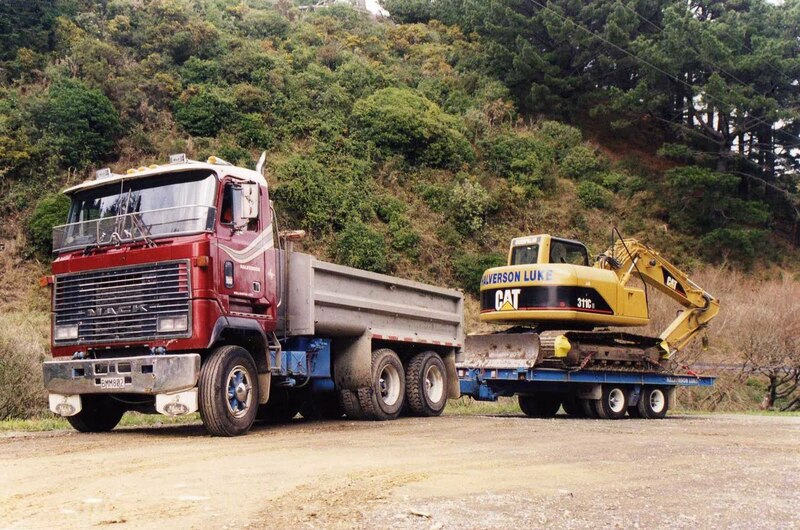 John Ray Ltd is a confirmed Mack user and was still running an old R series until it suffered an accident quite recently. 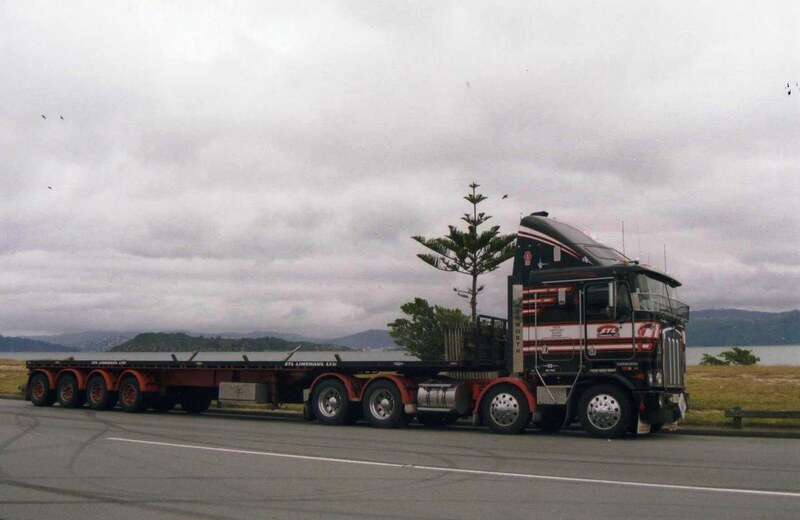 This 1999 CH688RST and trailer is pictured at Petone. 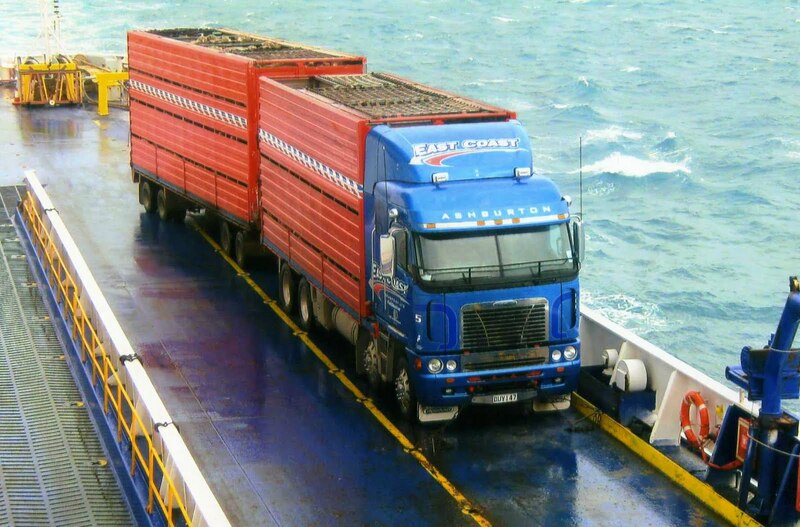 This 2007 Freightline Argosy from Ashburton, about midway down the East coast of the South island, is photographed midway across Cook Strait on the deck of the M.V. 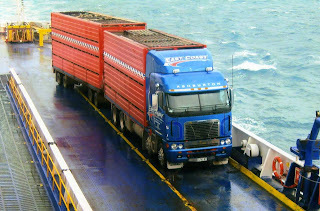 Kaitaki, with a load of sheep heading to the North Island. 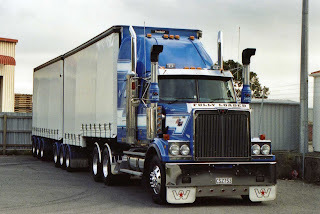 Intercity Haulage operate this 2005 Mack CL688RS Trident , looking very smart in it's plain white with simple blue stripes. With it's 3+2 B-train, it is parked at Porirua near Wellington. You have good points there, that's why I always check your blog, it seems that you are an expert in this field. keep up the good work, My friend recommends your blog.